Transacting with government offices rates highly on my list of unpleasant experiences, particularly if the government agency happens to be the National Bureau of Investigation (NBI). I shudder to remember the quaint early days of applying for an NBI clearance at the bureau’s main office along Taft Avenue. Getting an NBI clearance then was a whole-day affair that tried my patience, crushed my spirit, and tested my faith in all of humanity. When the dreaded time came for me to renew my passport, I realized I’d have to go through the ordeal once again. Though I had all my pertinent identification documents in order and probably wouldn’t need an NBI clearance, I’m sure you’d agree if I said that you can never be too sure with government employees, especially the kind who sit behind a glass window and have the power to make your life miserable. 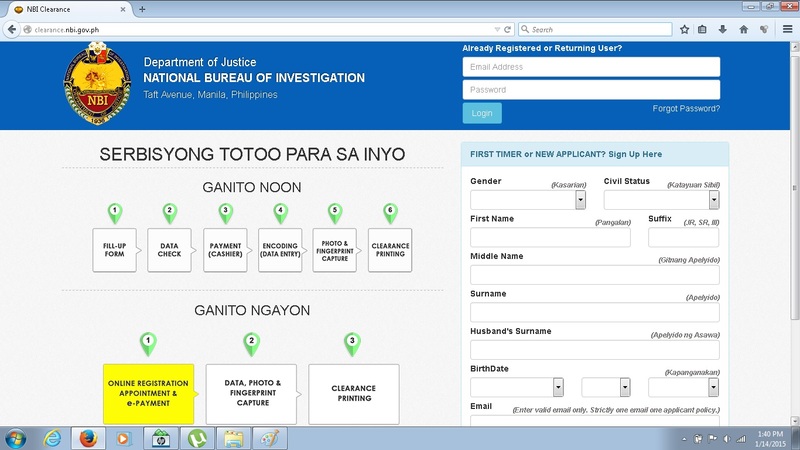 Fortuitously the NBI launched what it was calling a new and improved online clearance application system in January 2015, coinciding with my need to get a new NBI clearance. I was skeptical at first, having read accounts of applicants still enduring serpentine queues at NBI clearance centers, despite an online initiative introduced the year before. Well it looks like the NBI has finally gotten its act together because when I applied for my NBI clearance at the bureau’s Manila headquarters on January 14th, it took all of 30 minutes to get my hands on the precious piece of paper that vouches for my non-criminal character. You, too, can get an NBI clearance without losing your sanity by doing as I did. New users will need to register by filling out the form on the home page. Fill out the form as completely as you can. Provide all pertinent details. Enter the e-mail address you would like to use as login name. Type in your desired password. When you are sure about the information you have entered, tick the box next to the “I ACCEPT TERMS OF SERVICE.’ Click the Sign Up button to submit this form. 2. Once you have signed up, you can now fill out your NBI clearance application form. Make sure you fill out the form completely and correctly. When you are done, click the SAVE INFORMATION button. 3. Next, you will be taken to a page that shows your application details. Verify that all information you have entered is correct. If you wish to make any changes, simply click the EDIT INFORMATION button. When you are sure about your application details, click on the APPLY FOR CLEARANCE button to continue. 4. A pop-up window will appear asking for your application type. Choose NEW if you are applying for the first time or RENEW if you have secured a 2014 NBI clearance certificate (if the last/latest certificate you obtained is older than 2014, you must choose NEW application. Click the I Agree button to continue. 5. 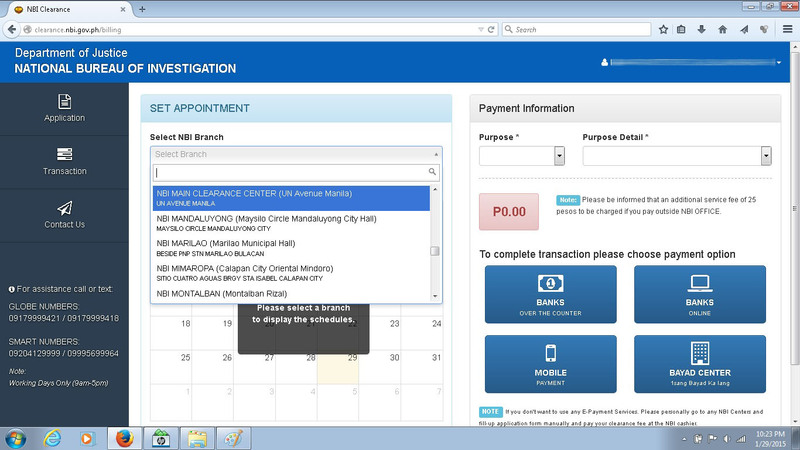 You can now set an appointment for personal appearance at any NBI clearance center. Select your preferred NBI branch. Choose a date and time slot (either AM or PM) from the blue shaded boxes. 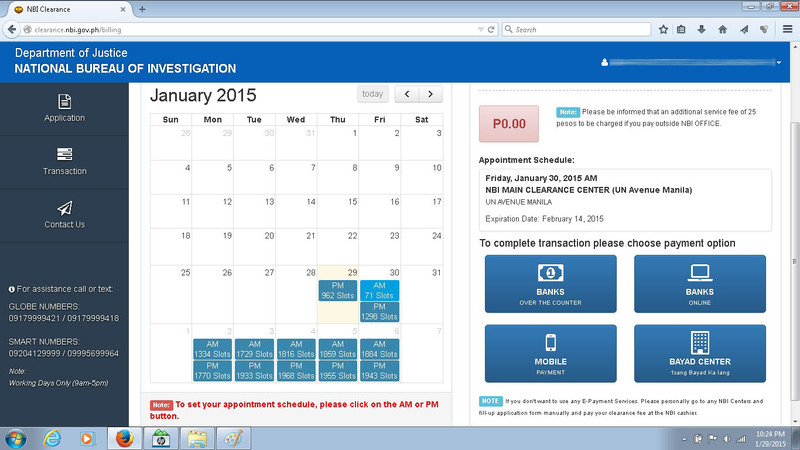 Notice that there is an Expiration Date for your appointment, which is 15 days from your chosen date. I’m not sure if this means you can just turn up at the NBI clearance center within those 15 days if you missed your original appointment. For your peace of mind, I suggest you honor your original appointment. 6. On the Payment Information panel, choose the Purpose of your application and the corresponding Purpose Detail. 7. You are now ready to choose your payment option. 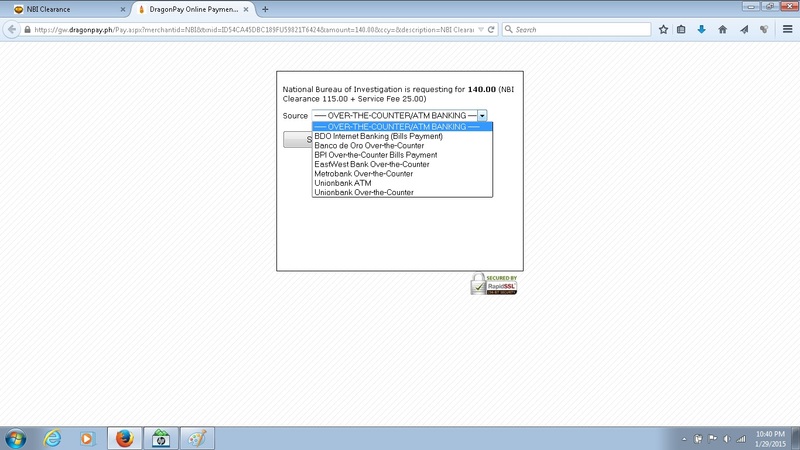 Hover your mouse pointer over each payment option to find out more details. Once you have selected your payment option, a DragonPay Online Payment window will appear. 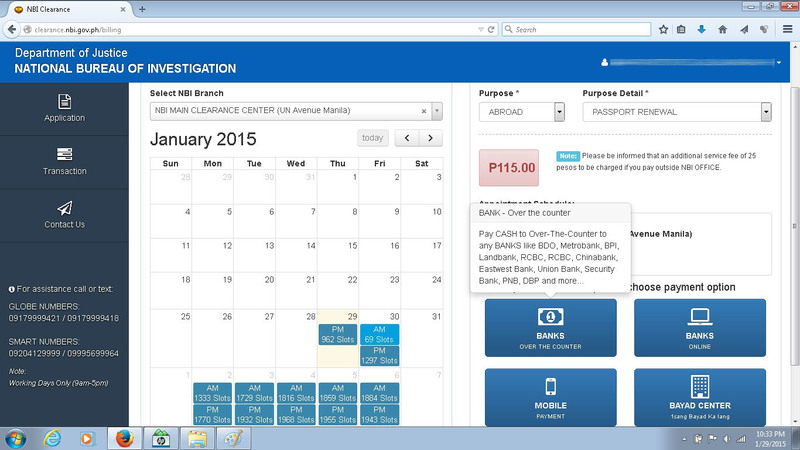 You will see the following message: “The National Bureau of Investigation is requesting for 140.00 (NBI Clearance 115.00 + Service Fee 25.00).” Click from the options that appear on the drop-down menu and then click SELECT to proceed. Here’s where it got a little confusing for me: I initially chose BANKS ONLINE as I wanted to pay online through my BDO account. When I clicked on this option, a host of choices appeared in the drop-down menu, including RCBC AccessOne, UnionBank EON, UnionBank Internet Banking, and BDO Internet Banking (Funds Transfer). I don’t remember ever using the Funds Transfer option on BDO Online to pay my bills. Consequently I closed the DragonPay Online Payment window. I had to choose another payment option, so I clicked on BANKS OVER-THE-COUNTER and voila! 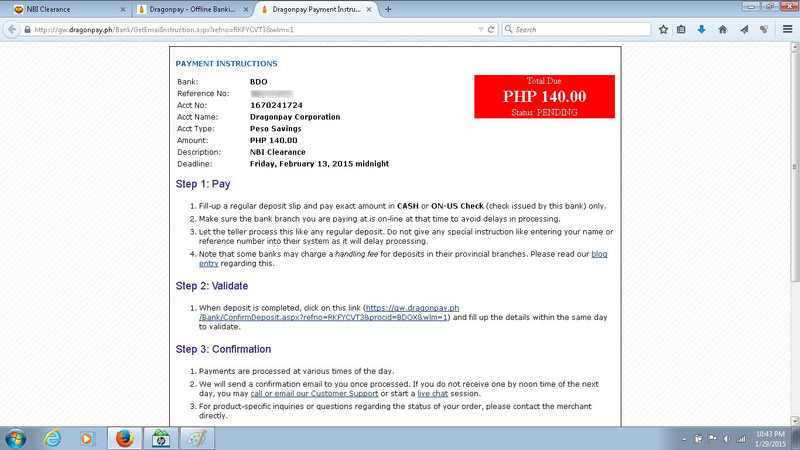 The BDO Internet Banking (Bills Payment) option appeared, among others. 9. A Payment Instructions window will appear. You will also see a deadline for payment of your NBI Clearance, which is generally 14 days after your chosen appointment date. 10. You can verify the status of your application by clicking on the Transactions button on the left side of your user profile page. Initially your application will be marked Unpaid. 11. Pay for the clearance fee using your selected payment option. After depositing your payment, allow a reasonable amount of time for payment to be processed and confirmed. It generally takes less than 24 hours for your payment to be confirmed by the Dragonpay system. 12. Once your payment is confirmed, your application will be marked PAID and you may now print your application form. 13. Click on the PRINT button under the Action column. A PDF file of your filled out application form will open. 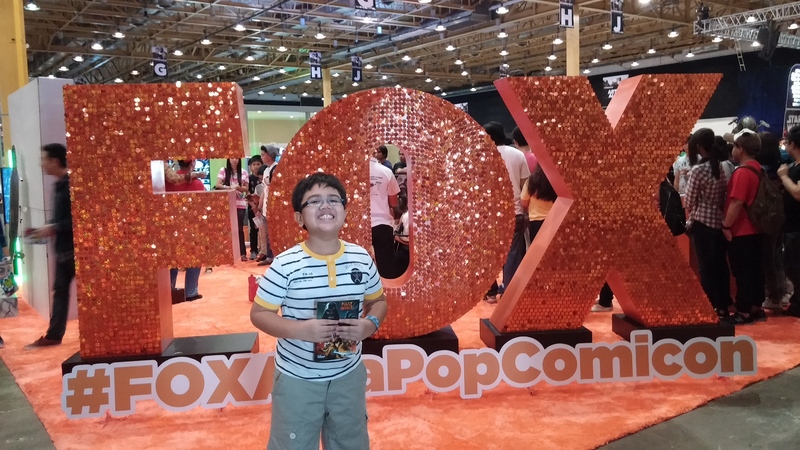 You can print this form right away or save the PDF file for printing later. 14. Bring the printed form with you on the day of your appointment. When I went to the NBI Main clearance center on Taft Avenue, I was instructed to proceed directly to Encoding on the building’s second floor. There was a separate queue for those who had applied online. At the Encoding step, your details will NOT need to be re-encoded. It just happens that photo and fingerprint capture is done at Encoding. The NBI clerk will pull out your file from their database using your transaction reference number and verify that all information are correct. If your name doesn’t get a hit, you may proceed to the final step, which is Clearance Printing. Note: My brother, who had applied a week earlier than I did, was told to proceed to the third floor of NBI Main. Could there be two floors for Encoding and Printing? I don’t know. My advice: Don’t be embarrassed to approach any NBI personnel for help. I kept asking “Is this the queue for online applicants?” and not once was I called “makulit” (annoying nag). Total time I spent inside the NBI Main clearance center: 32 minutes. Total impact on my well-being for being spared the stressful Anaconda-like queue: Priceless. Hi, I just want to ask why does your Husband’s Surname blank? but then it says youre married? IM assuming that what you have on your family name is your married name? I just want to know because I need my NBI for immigration purposes, and I need to have my maiden name and married name shown on the NBI clearance. Basically I need the AKA/other names used. Hi. I kept my maiden name even after I got married. Which surname have you been using in your official documents (SSS, TIN, company IDs, etc. ), your maiden name or your husband’s surname? If you have been using your husband’s surname, then that is what you indicate as your surname. Also, bring your marriage certificate. Wow, thanks for the quick reply. Ive been using my husband’s surname on just about any documents/forms etc since I got married last year. I am specifically asked for my NBI to have the AKA by the US Embassy, and seeing the NBI/pic you provided I cannot place where the AKA should appear. But thank you for the clarification. AlSo I just noticed that the ‘look’ of the clearance is different from what I know (since the last time I had to get an NBI clearance was 2010) If I remember correctly there were 2 copies and in the other one I know theres some kind of watermark? that says “personal copy”. Thank you again. Hi. 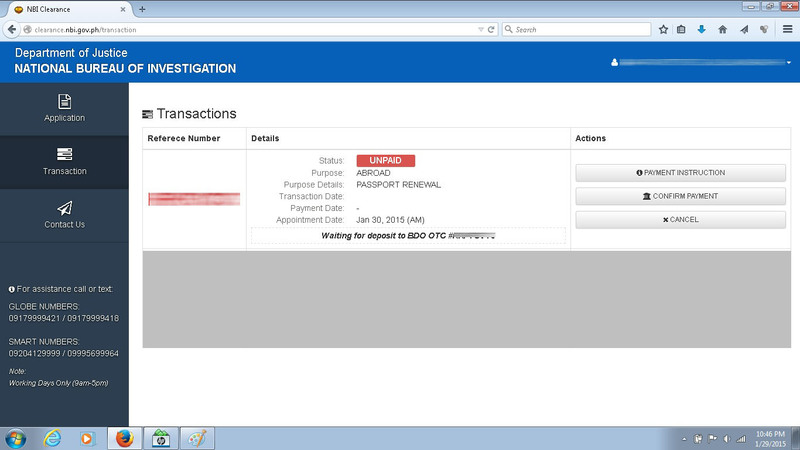 Ano pong reference number ang ibibigay sa BDO upon deposit? Kasi po nadeposit ko na kanina at yung ref. number na may letters, ayaw daw sa system nila tapos meron pala binigay na ref. number na consisted of pure numbers lang. ang nakalagay ‘BDO DEPOSIT REF. NO.’ yun po ba yung ibibgay sa BDO upon deposit? Yun po kasi binigay ko pero hanggang ngayon di pa ako nakakareciv ng confirmation ng payment ko. Based on my experience, ang reference number ay combination ng letters at numbers. Halimbawa: H2DRX242 (eight characters yan). Yun bang reference number mo ay nagsisimula sa NB at umabot ng ten characters dahil dito? Kung gayon, tanggalin mo ang NB at i-type mo lang yung eight characters na kasunod nito. Ano po ngyri? anu po b kailngn ilgy sa bdo slip ung bdo deposit ref. No po b? Or ung account no? Ang ilalagay mo ang iyong DragonPay reference number. Ang alam ko usually credited within 24 hours ang payment. 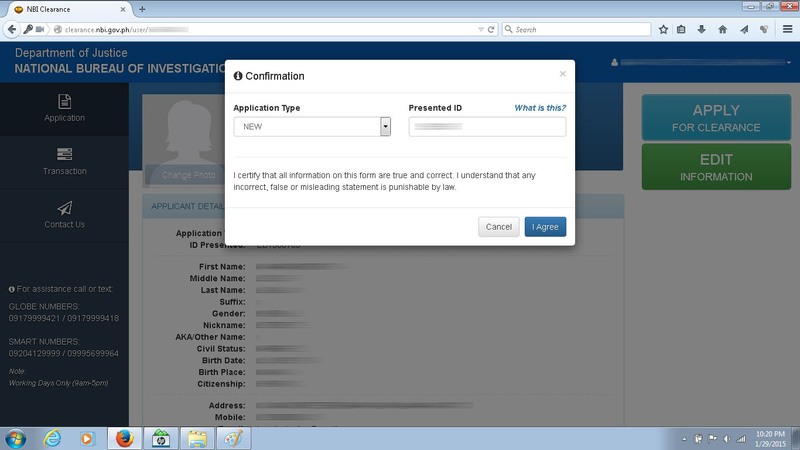 Hi admin, kaya siguro naka pending pa sa website ng nbi ung application ko? isa pa pong question ok lang po ba na TRAVEL QATAR at hindi travel abroad lang ang ilalagay? salamat po sa quick response. hi i have the same situation right now i need for embassy? my name was corrected . and i need nbi clearance for my aka.how did it go and whats the procees for getting NBI aka clearance? Hi tanong ko lang po sana pano po kung kakakuha ko lang ng nbi clearance ko a month ago lang and kailangan ng another copy? Same process pa rin po ba or kahit straight na ko sa center? Thanks in advance. I don’t know of anybody who has renewed his NBI clearance by simply walking in without a prior appointment under the new system. I suggest you call up the NBI itself to ask. Also, I remember reading somewhere that NBI would no longer entertain walk-in applicants starting April 1,2015 (don’t know if it applies for renewals also). But just to be safe, I’d apply online if I were you. That way, you’ll be assured a slot for the day. On the printout of your NBI Clearance Application Form, you will see a “Valid Until” date, which is typically 15 days from the date of your appointment. I suppose it means you may still proceed to the pertinent NBI center/satellite office within the application validity date, in case you missed your previous appointment. But don’t take my word for it. I suggest you call up the NBI to be sure. Hi, Rose. You don’t have to take any special steps to continue to use your maiden name in all your IDs. But you must show that you have been consistently using your maiden name in all your IDs and documents (especially passports, SSS/TIN, and company IDs), even after marriage. Once you start using your married name, you cannot revert to your maiden name unless under specific conditions. (Please read these articles for reference: http://www.manilatimes.net/married-woman-obliged-use-husbands-surname/116208/ and http://famli.blogspot.com/2013/10/surnamemarriedwomanpasspor.html ). I do remember entering my husband’s surname in the NBI clearance application form, but I typed in my maiden name in the surname field for my personal information. The NBI clerk looked at my data and asked if I wanted to use my maiden name. I said yes. 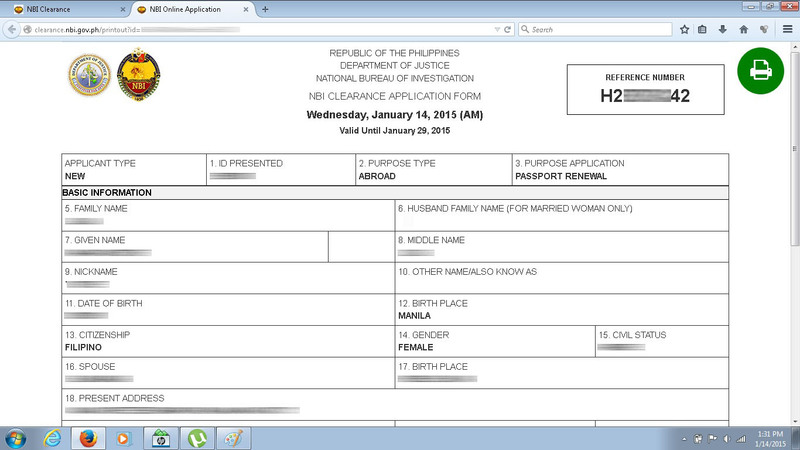 The NBI clearance printout only shows my family (maiden) name but not my husband’s surname. The NBI started implementing the biometric system for clearance applications in 2014. Under the biometric scheme, the digital scanner replaces the old ink-based system for collecting and storing fingerprints. If your NBI clearance was obtained prior to 2014 (you made your fingerprint impressions the old-fashioned way, using ink), you will have to start all over again and apply for a new one. Otherwise, you can apply for renewal. pakilinaw lng po kung anong ilalagay sa metrobank deposit slip? yung ref. no. na 8 cha. or yung accnt. no? Ang ilalagay sa deposit slip ay yung DragonPay reference number na eight characters. Hi! I just want to ask, is there a specific time for AM or PM slot? I clicked on PM. Can I go to the branch anytime within PM slot? The last time I used the online system, there were specific AM and PM slots of 30-minute blocks. You have to appear at the time slot you have chosen. Hi. You may read this guidance on obtaining an NBI clearance when applicant is abroad . Good luck! I just renew my nbi last dec but the US embassy asked me to get a new NBI clearance with aka name. My maiden surname is Quintu instead of Guintu in my birth certificate. Amendment has been made by NSO. Should i apply for renewal or change of name. If my purpose is change of name can I use the nbi clearance for US visa application. Our visa application is pending due to nbi clearance with aka name. An acquaintance once found herself in the same predicament. She applied for renewal of NBI clearance. The NBI has personnel to assist you in special cases like yours. Good luck. my family of five would like to apply for nbi clearance. do i have to create 5 email accounts for sign up? tnx..
I’m really not sure, Eve. But it does look like you need to create 5 email accounts for each adult member of your family. Hi, I would just like to ask if it’s possible to reschedule your appointment date? A friend of mine couldn’t come on the day of his original appointment. Instead of trying to call up the NBI to reschedule, he turned up at the NBI office and showed his receipt and NBI application form. He was allowed in and got his NBI clearance. I believe you can do the same, as long as you show up before the validity of your appointment expires. Good luck! I believe you can show up at the NBI some other day as long as your appointment remains valid. (There should be an expiration date for your appointment, around 15 days from your indicated/chosen date). You may opt to get a new one, Nina. But I suppose it’s easier to renew. Hi confused lang po ako sa biller name, mgbabayad ako sa bayad center, ang nkalagay sa instructions is ang biller name is NBI but you said it should be dragon pay which is which po? Thanks admin! Since you are applying through Bayad Center, I suggest you accomplish two payment forms (one using NBI as biller name, and another using Dragon Pay) just to be sure. The Bayad Center teller would know which one to use. Instructions for Bayad Center payments are given on the Dragon Pay website. You will see they specify that NBI be indicated as the biller name. When I applied for my NBI clearance a year ago, I paid online through BDO by following the online instructions provided by Dragon Pay itself, which advised selecting Dragon Pay from a drop-down list of billers. But that was for online payments. My brother, who paid through Bayad Center, initially wrote NBI on the biller name but somehow the Bayad Center personnel couldn’t get the transaction to proceed. They agreed to try using Dragon Pay as biller name (and dropped the “NB” from the transaction reference number) and behold, it worked! Siguro nagkaproblema lang nung umpisa kasi bago din lang ang pagsali ng Bayad Center sa NBI clearance payment, marami pang empleyado nila ang hindi nakakaalam nito. Pero ngayon, marami na silang experience dito. Good luck! Hello, Velle. Depende kung kailan yung deadline ng appointment mo. 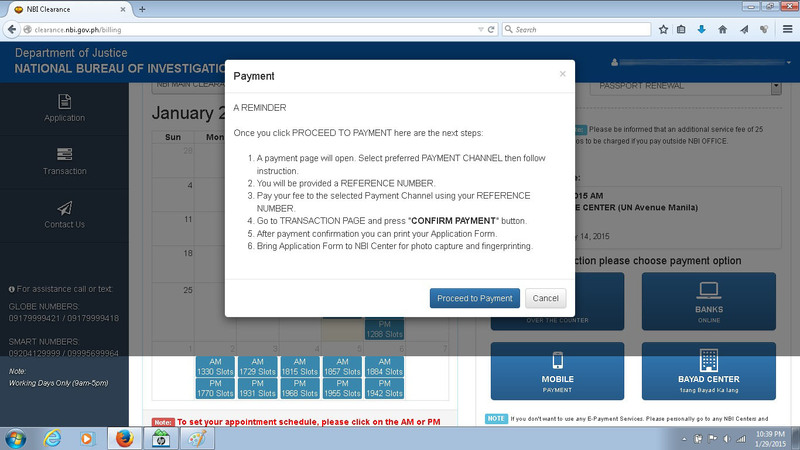 Mayroon nakalagay sa payment confirmation mo. Kung ako sa iyo, pupunta na lang ako sa NBI sa lalong madaling panahon. Good luck! Naka-save yung completed application form sa account mo. Pwede mong i-retrieve anytime and ipa-print sa Internet cafe na pinakamalapit sa iyo. Hi, Mark. You should see the code printed on your NBI Clearance Application Form. If you don’t see it, your application might’ve encountered a technical error. I suppose you can try again. Hi nagpaschedule ako s Robinsons Cainta branch and paid na yung clearance ko, ok lang kaya na sa Robinsons galeria na lang pumunta if ever? Hello, Reynold. May kakilala akong ganyan din ang ginawa. Pinayagan naman siya. Good luck! Hello Rose. Pwede yung maiden name mo pero dapat hindi mo pa nagagamit yung apelyido ng husband mo sa iba mo pang documento o ID tulad ng company ID, SSS, TIN, passport, etc. In short, dapat consistently yung maiden name mo ang ginagamit mo hanggang ngayon. 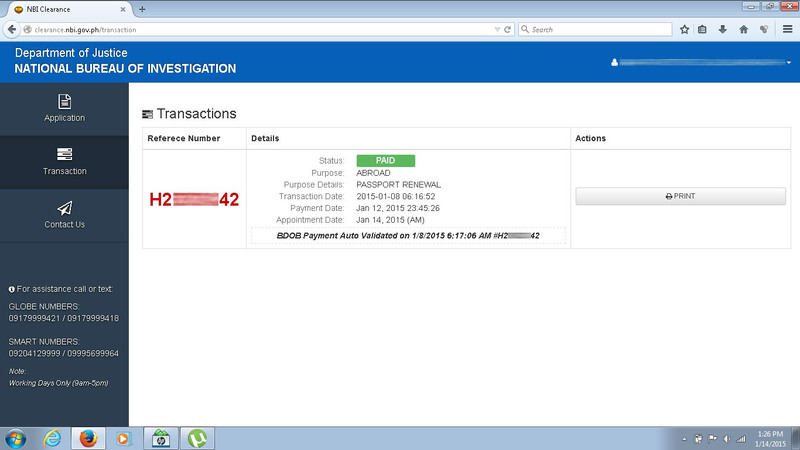 Payment successful using bdo online banking pero Reference no. expired daw nung mag validate ako by clicking the link na provided nila e Hnd ko pa nalalagay yung ref no. Ano gagawin? Hi, Ae. 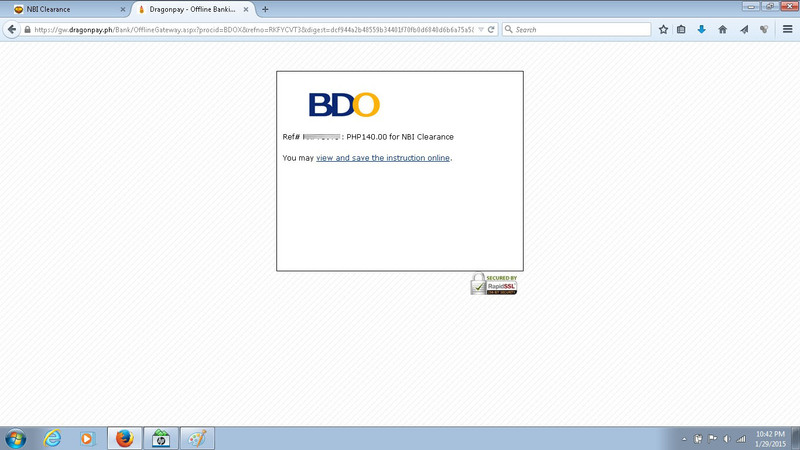 You may have to contact BDO for assistance regarding your concern. Good luck! Hi. I made a mistake in my profile. I accidentally put my nickname on the suffix. I can’t edit it anymore. Can I just create a new account or will that conflict their system. I was able to successfully get my clearance last year. They edited it upon my visit to their RO. But upon upon checking it again last night for applying for a renewal, the mistake is still there. Can I just create a new account as to avoid having it edited every time I go there? Hi, Timothy. I suggest you create a new account instead. Hello, Tina. Pwede pa yan. Magpunta ka na lang sa NBI nang maaga para ma-accommodate ka agad. hi my name has a special character on it, a dash. and i couldn’t register online without taking the dash out. was it possible to continue to register without the dash and then just have it putted when my name was about to be encoded? Hello, Jay-cel. Yes, you may do that: register online without the dash and have the dash inserted during the encoding process. As part of the encoding process your information is verified in your presence, so you can have the NBI clerk make the necessary corrections, should there be any. Hi po. Nakapagregister na kasi ako online pero walang lumalabas sa email ko na verification. Pwede po bang dumiretso na ko sa bayad center? Saka nakascreenshot lang po yung ref. no ko. Okay lang po ba yun? Thanks po. I’m afraid I don’t know the answer to this, Chai. Pwede mong i-cancel ang existing application mo at gumawa ng panibago, para sigurado. Hi! I just registered online. But I didn’t get any email to verify my account. I’ve input my details on the applicant info, contact, fam, educ background. Clicked on the submit button. I didn’t/cannot see the ‘apply for clearance’ button on the upper right. I wonder if this online clearance thing is still ongoing. Hi, Annie. You may have to contact the NBI for technical support. 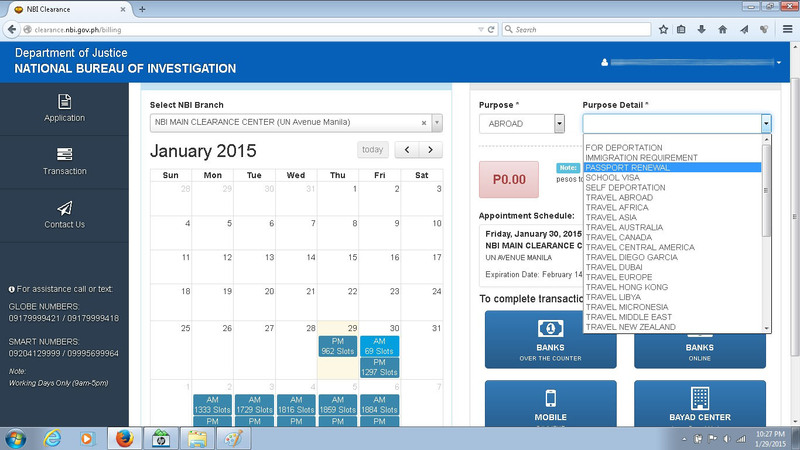 There is a Contact Us menu option on the NBI Clearance homepage. Possible po kaya na sa Tagaytay na lang kunin yung NBI instead sa chosen clearance center ko sa Rob Pala-Pala? sobrang haba and gulo po kasi ng pila dun tas puro din fixers. Hello, Aly. I know of people who have done the same (applied online to one NBI satellite office and went to another NBI office on the actual date of appointment) and were successful. Go for it! OK lang yun, Ryan. You may ask the encoder to input the correct height at the Encoding section. Hi sis I have a question about the husband’s surname, I would like to use it as my new surname na so my old surname would be my middle name na ba pano po yun? lalagay lang tlga yung husband’s surname and my maiden name sa info or do I need to change my family name as my husband’s surname na? sorry nacoconfused lang po please help me. kasi need for my visa na mag change ako ng name e. Salamat! Your new surname will be your husband’s surname, and your maiden name becomes your middle name. When in doubt, you can have the entries corrected and verified at the Encoding section before the NBI Clearance is printed. hello! paano po kung nakabayad at nakabiometrics na ako pero hindi ko pa nakukuha yung nbi clearance ko. pwede ko pa din ba kunin yun? gaano po katagal bago maging invalid. Thanks!!! Hi, Shy. Do you mean that you haven’t picked up your NBI Clearance? I don’t know how long the NBI will keep it before they dispose of it. Suggestion ko ay pumunta ka na lang at baka nasa kanila pa. Ang NBI Clearace ay valid for one year. Hi, Daniel. Sayang naman. Kung ako siguro pupunta na lang ako sa NBI sa lalong madaling panahon at ipaliwanag sa kanila kung bakit hindi ako nakapunta. Sa totoo lang, madali silang kausap. Good luck. Pano po yun kung 25 days na po nakakalipas expired na po ba yung binayad sa bayad center pag ganun? From experience, 14 days valid ang payment mo. You cannot use the same code. Kailangan mong mag-apply for another clearance kasi babayaran mo ulit yun. 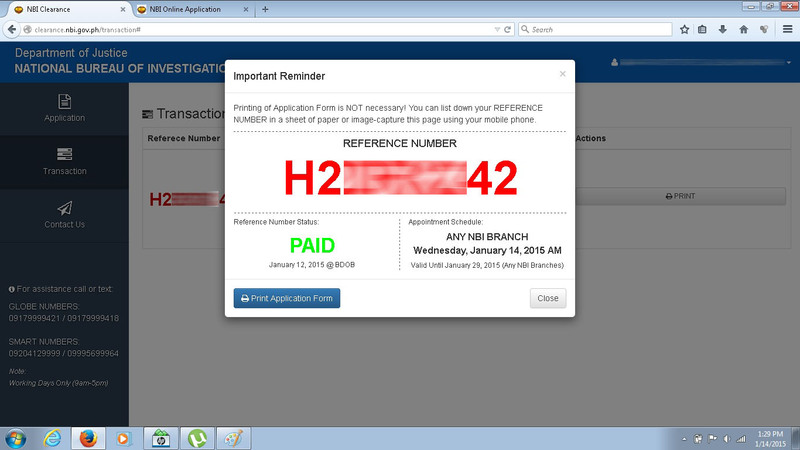 ASK KO lang po if pwede po ako pumunta sa nbi branch ng mas earlier than the date ng schedule ko kung saan nka lagay po sa application online ko . Just in case lang po kasi mas free ako this week pra mas maaga po ako makakuha. Pwede siguro. Mabilis lang naman ang NBI Clearance. hi itatanong ko lang po if pag renewal ba kukuhanan pa ulit ng biometrics? or pedeng representative na ang pumunta sa scheduled date? Does anyone know if this is possible? I can’t go to the NBI myself and want someone to go there on my behalf. Hi. That seems to be a technical issue and you should contact the website administrator for that. Got my Nbi clearance then went straight to dfa for authentication. But verifier wants the barcode longer, mine was short so they wont accept. Any idea why? I’m sorry, but I’m absolutely clueless about this. Hi! I missed the deadline. Do I have to pay again? Or I can just reschedule? I also forgot my username! haha. So I can’t log in. Hi di ko po maretrieve ung data ko with special character kasi unh Name ko. For renewal po sana ko. hi. pwede po ba magbayad sa mismong NBI Center? offline kase yung mga bayad centers dito samen. Thanks! Hi, Mary. Pwede basta i-print out mo yung application form. how can you print it out? ganon din kasi sana ang gagawin q dahil i need my clearance asap. i can’t wait for the centers to get online? Hello! How can I obtain an NBI ID after getting thr NBI clearance? Hi. Di ko po alam na may validity pala yung appointment. Ang pinili ko po April 12 pero after oo magbayad biglang sabi na valid until April 6. Ano po pwede kong gawin? Hi, Yan. Hindi ko alam kung bakit valid until April 6 pero nakapag-set ka ng appointment sa April 12. Pero kung bayad ka na at may pruweba ka (resibo) at malinaw na April 12 slot mo, sa April 12 ka pumunta. What time should I go to NBI Office for my AM appointment? Bakit ganun ibaiba ang charge ng payment center as 711 155 php binayaran ko sabi 140php LNG …. I experienced the same thing today. I thought it was only 140 (since it’s the amount indicated by the site) then at the counter, one of the cashiers rejected that piece of paper i got from cliqq kiosk explaining that the amount must be 155 and not 140. I asked why but he couldnt provide me a valid answer. He bluntly responded with “di ko rin alam”. Medyo bastos pa nga sumagot. Hayyy Nagbayad na lang ako ng 155 para matapos na. Tanggalin ko muna sa registration, tapos i-correct mo na lang sa Data Entry step pag nasa NBI ka na. humihingi paba ng valid id sa nbi center and sa bayad center? wla pa po kasi aqng valid id eh…. pwede bang nso? thanks po. Opo, dahil kailangang ma-verify yung identity nung applicant. nso po ba pwede na? Saan po makikita yung barcode?? tska ok lng po ba kung ref# lng maipakita sa nbi para malaman nila na nagonilne aq? kelan po lumalabas yung PRINT button? nung nag online po kasi aq, blank yung ACTION eh…. lumalabas lang ba yun pag PAID na?? Sana po masagot niyo. Hi! 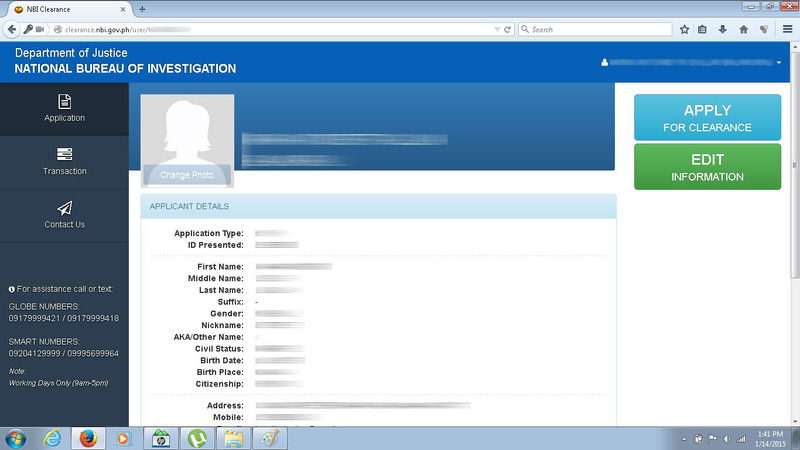 pwede po bang mag-claim ng NBI clearance na applied sa satellite branches sa main office sa UN Ave.?thank you! Helo po quick answer nmn po. Makakakuha po b aq ngayon ngeh nbi khit nxtmonth p po schedule ko..need ko n po kc xa bukas for employment..
good morning po. nag apply po ako online and i already paid for it. di po ako nakapunta sa appointment ko. 4 days palang po nakalipas. possible po ba na bibigay parin nila yun pag pumunta ako? Hi! meron pong nakalagay na “valid until invalid date” . ok lang po ba khit after 1 week ko na makuha ung NBI clearance? Since they’ve streamlined the process of NBI application, the NBI staff have become more reasonable when it comes to people who are unable to show up for an appointment. As long as you have a valid reason, they’ll let you in. Hi, Reinabel. I don’t think you can cancel. Just don’t show up at the other appointment, I guess. Hi pede pa po ba makuha yung clearance kahit last year pa yung appointment? so April 24, 2016 kasi ako nag appointment then nabayran ko narin sya last year. Pede ko pa ba makuha yun? Hi po. Just want to ask, pano po pag wala yung print button below the action? hi, ask q lng po if pwede pa ba ipareched ng mas maaga yung appointment sa nbi.? kaso nabayran ko na po sya.. for example na sched ko po sya ng oct 30 then iparesched q sya ng 15?? pede po kaya un? or do i need to set another appointment..? sayang naman po yung binayad ko if another appointment pa..
morning! ito din po ang concern ko po.. i hope the admin will reply about this. may concern po ako yung reference number na binigay sakin para mag bayad sa bayad center ay invalid sabi ng teller does not exis daw yung reference number tapos bawal na mag over the counter so what should i do my appoinment is tomorrow ?